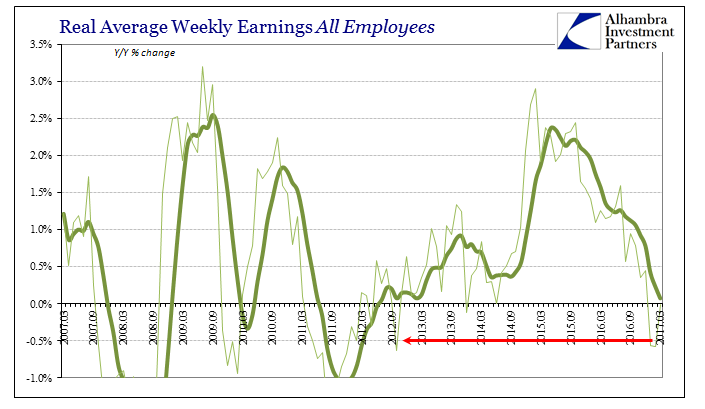 For the third consecutive month real average weekly earnings fell year-over-year. In March, at least, with the CPI starting its downward leg the decline was by the smallest amount; essentially flat but fractionally less than zero. It was the first time real wages have fallen three in a row since early 2012. The six-month average is just about zero, too, unsurprisingly also the lowest since mid-2012. Despite the unemployment rate falling well-below 5%, there isn’t the first sign of wage acceleration in nominal terms. That has left real wages to the whims of oil prices, first as their biggest boost in years as oil prices, like early 2009, collapsed and now on the wrong end of them as they partially rebound. The overall negative effects aren’t so much the decline in real terms as the unstable and highly volatile nature of it all that never really gets better. With an unemployment rate that stands at 4.5 percent, that’s even a little bit below what most of my colleagues and I would take as a marker of where full employment is. She then added for good measure, “I’d say we’re doing pretty well.” So where are the wages? 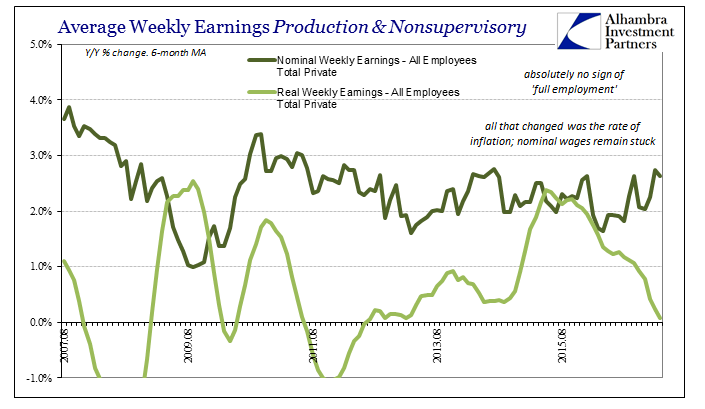 If the unemployment rate is an accurate depiction and it is significantly (not a bit) less than the full employment mark, nominal wages should be accelerating quickly and more so all the time. The base effects of oil prices should not be a matter for any consideration but a small footnote on economic completion. Yellen may refuse to admit it, but “something” is not only missing but has to be missing. From her comments she is either being disingenuous or she has bought into R*, either option leads nowhere good. If it’s the latter, and I’m sure it is, then the once-perpetually optimistic Federal Reserve has joined the club of doom and gloom. The only difference is that the current thinking on R* places the gloom at someone else’s doorstep (yours).